Heartland Animal Hospital was initially accredited by the American Animal Hospital in 1996. Unlike human hospitals, animal hospitals are not not required to become accredited. Heartland Animal Hospital made the choice to pursue this distinction. Our hospital is evaluated on approximately 900 standards of veterinary excellence in order to become accredited. Standards address patient care and pain management, surgery, pharmacy, laboratory, exam facilities, medical records. cleanliness, emergency services, dental care, diagnostic imaging, anesthesiology, and continuing education. AAHA-accredited hospitals are recognized among the finest in the industry, and are consistently at the forefront of advanced veterinary medicine. Less than 15% of all US animal hospitals have met these high standards. To maintain accredited status, we must undergo comprehensive on-site evaluations every three years, and our office actually looks forward to meeting this challenge! Heartland Animal Hospital has a board certified veterinarian on staff. Dr. Jennifer Hart maintains certification as a Diplomate of the American Board of Veterinary Practitioners (ABVP) specializing in Canine and Feline Practice. This is a voluntary veterinary specialty. The certification process demonstrates that Dr. Hart has kept up with changes and advancements in veterinary practice. Dr. Hart took and passed a challenging examination in order to initially certify in 1998, and she has continued to test every 10 years. ABVP was established in 1979. It is one of twenty-two veterinary specialty groups accredited by a special committee of the American Board of Veterinary Specialties, a division of the American Veterinary Medical Association, to recognize excellence in clinical practice through the certification of species-oriented specialists. Heartland Animal Hospital is a Cat Friendly Practice with GOLD status! The "stress" of a visit to the veterinarian often prevents our feline patients from receiving the care they need. By actively seeking Cat Friendly Practice Certification via the American Association of Feline Practitioners, our staff has demonstrated the skills, equipment, and facility requirements to help alleviate stress. Our staff is well trained and experienced in alternate techniques to calm an anxious cat. We have the equipment that cats require, and we have a facility that allows cats remain separated from dogs at all times. 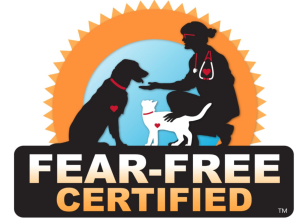 We are proud to have a Fear Free certified professional on our team and we are dedicated to caring for your pet's emotional well-being as well as his or her physical well-being. We promise to keep our voices low and calm, and to never use force to examine, test, and treat your pet. We'll use gentle control techniques, innovative tools, and medication when necessary to ensure your pet's emotional health isn't sacrificed from the sake of medical care. Some pets prefer to be examined up high, on the table, in your lap, in their carrier, or on the floor. We'll go where we need to go to make your pet comfortable during the exam. We'll also use specialized distraction techniques to keep your pet focused on good experiences while we preform procedures such as injections that might cause brief stress or pain.